Invest an hour to get great results. Installing trim is a popular but challenging project because it requires skill and precision to achieve a flawless look. We developed this video to walk you through the process so you are well prepared beforehand and can easily review any segment as needed, saving time and ensuring beautiful results. Two experts...three typical projects. Follow two experts as they show you how to approach three projects: assembling and installing crown molding, running baseboard, and trimming out a window. Transform a room with gorgeous moldings. Master carpenter Tucker Windover shows you how to choose the right molding profile, assemble elegant moldings, and achieve a perfect fit. Learn his trade secrets for matching at the corners and a seamless finish while avoiding typical pitfalls that can mar the beautiful results you want. Refine your carpentry skills. He also demonstrates his time-saving methods for installing baseboard plus techniques for coping, mitering, and trimming around drywall. With this expert advice before you begin, the job will go smoother and you'll be a lot happier with the results. Update a window with a complete makeover. Watch a pro work his magic as Kit Camp remodels a dated window treatment with a new trim surround. You'll pick up a lot of pointers, know how to deal with hidden problems, and save yourself some headaches by building in the right order. Build your skills and do better work. 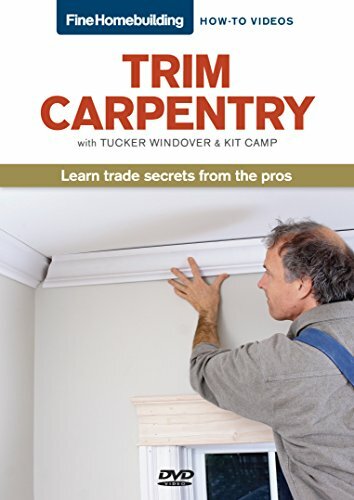 With this video guide you'll have the confidence to tackle trim projects, improve your skills, and learn techniques you can apply to other home projects. The time you invest in watching this video will really pay dividends.